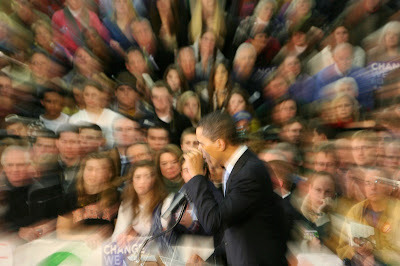 Barack Obama in New Hampshire (Jan 4, 2008). Click for LARGE image. MoveOn has never endorsed a Presidential candidate. The odds were high it would not this year either. A two-thirds super-majority is needed to endorse. Yet Obama took those odds, beating Clinton in the membership of MoveOn which voted, by over 40%. Obama welcomed the endorsement on Friday. "In just a few years, the members of MoveOn have once again demonstrated that real change comes not from the top-down, but from the bottom-up. From their principled opposition to the Iraq war – a war I also opposed from the start – to their strong support for a number of progressive causes, MoveOn shows what Americans can achieve when we come together in a grassroots movement for change," he said in a statement. "I thank them for their support and look forward to working with their members in the weeks and months ahead," he added. Organizers said they would "immediately" begin mobilizing on behalf of Obama, leading turnout programs and phone-banking members of MoveOn in targeted states. The group made seven million "GOTV" calls for Democrats in the mid-term elections, and it has an extensive voter file database. The decisive victory shows that Obama is consolidating support from the netroots in the wake of John Edwards' withdrawal. Obama also won the Edwards vote in Thursday's Daily Kos reader poll. He bounced 35 points to reach an all-time high of 71 percent, while Clinton held steady at 11 percent. If Super Tuesday is a tie and both campaigns brace for a protracted delegate hunt, Obama could draw fundraising, volunteers and advocacy from a united front of MoveOn, netroots activists and bloggers. Here is what I want you to remember. The netroots are not the Democratic Party, as Howard Dean famously found out. The Democratic Party is not the American electorate. There are independents, and oh yeah, Republicans. Plus Greens, Libs, undecideds, and others. It is a lie that the ideas of the Democratic Party are not the ideas of America. They are and always have been. Now, more than ever. Especially now. That does not mean we can be careless how our ideas are presented, or who we have presenting them. Presentation matters. As you talk about MoveOn's endorsement -- and the Gods know there are enough of you who hate Clinton and are all about the Obama love -- please... PLEASE ...try to keep this at the level of political analysis, not at your feelings. Oh, it's fine to let your emotions come out to play for a little while; I don't want to spoil your party. What I'm saying is, please no more than a couple of posts from the same person about why Clinton is bad bad bad. GNB is not a place to bash people. Focus on the political implications of MoveOn's endorsement, not on how happy it makes you feel. The knock against Obama and his followers is all hat, not cattle. All emotion, no platform. Show me your analysis of what this means. Celebrate. But show me what it means. And that doesn't mean bash Clinton. I'm NOT kidding about I don't want to hear with the Clinton hatred. Enough already. There are a couple of you; you know who you are. Also, just a reminder. Neither GNB or any of GNB's writers are endorsing anyone publicly till the nomination is in the bag, at which point, we will put the traces on like good donkeys, and pull the Democratic wagon as hard as we can across the November finish line, whoever the nominee may be. If you think we're in the bag for anyone, you're wrong. Now enjoy the breaking news. A personal note: I'm out of town today and tomorrow, and unlikely to be on the net much. See everyone Sunday.